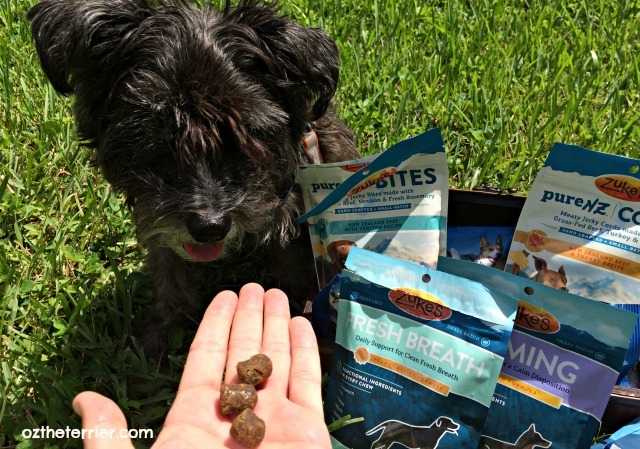 It’s been a while since we talked about Zuke’s dog treats and in that time, wow! Zuke’s has come out with a mountain of new products. 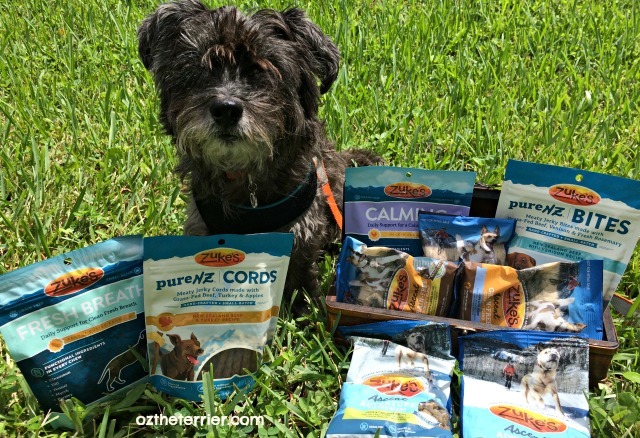 We were provided Zuke’s dog treats and food in exchange for spreading the word about their new products but Oz the Terrier only shares information we feel is relevant to our readers. Zuke’s is not responsible for the content of this article. We received so many new products from Zuke’s it is hard to properly review them all in one post. In addition, we were unable to give Oz some of the products either due to his poultry allergy or because we do not feed kibble (that’s right, Zuke’s now makes dog food). So, instead of a full review we are going to share information about the different products and either Oz’s feedback or feedback we received from some helpful paw pals. Adding to the lineup of Hip Action and Z-Bones are Zuke’s new Enhance Functional Chews. Enhance Chews include treats designed for Shiny Coat, Mobility, Endurance, Digestion, Calming and Fresh Breath. We received both Fresh Breath and Calming. Fresh Breath Functional Chews come in two formulas, Chicken Formula and Peanut Butter Formula. We received the Peanut Butter Formula so Oz has tried these chews. Enhance Fresh Breath Functional Chews have a balance of natural herbs to support clean, fresh breath from the inside out. Calming Functional Chews also come in Chicken Formula and Peanut Butter Formula. We received the Chicken Formula so we gave these chews to Bailey the Bichon, my mom’s dog. Bailey has some anxiety issues, ranging from mild (visit to the vet) to severe (thunderstorms). While my mom noticed no significant difference in Bailey’s sever anxiety, the vet did inform her at Bailey’s last visit that he was much calmer than before. The pureNZ Meaty Treats come in four styles – Bites, Cords, Steaks and Cuts. All Zuke’s pureNZ Treats are made from the best regionally-sourced ingredients straight from New Zealand for “farm-to-dog” freshness. The treats are made with grass-fed beef and fresh herbs. As you can see, Oz enjoys the pureNZ Bites which are made of grass-fed beef, fresh herbs and venison. There are two other flavors, both include the grass-fed beef and herbs, and either rabbit or lamb. The treats are tender jerky in bite-size pieces which can be torn into smaller pieces for training. The Zuke's pureNZ Cords we received were grass-fed New Zealand Beef and Chicken, so we again gave these to Bailey. Cords also come in Beef and Duck Recipe and Beef and Turkey Recipe. Reports indicate that Cords do not last but a millisecond with Bailey – he must think they are super tasty to eat them that fast. Ascent Natural Dog Food is packed with high-protein meats, fish or poultry and real, quick-dried fruits and vegetables. There are six recipes, all of which are made without corn, wheat, soy, or artificial preservatives, colors or flavors. We received sample-sized bags of each recipe – Chicken & Lentil, Lamb & Pea, Pollock & Chickpea, Wild Boar & Pea, Duck & Chickpea and Trout & Sweet Potato – all of which we gave to my cousins Levi and Lenox. Now, Lenox usually eats wet food because he is missing a lot of teeth however once Levi started eating Ascent, Lenox wanted some too. It turns out they both really liked the kibble. If you are interested in learning more about any of the products we received, you can click the links above to see each product on the Zuke’s website. There you will find full ingredients lists as well as guaranteed analysis, etc. Do you believe we have never actually tried Zuke's? We definitely have to do that! Looks good! Oz if I had that many pouches of treats and food at my feets, I think I would faint from joy!! 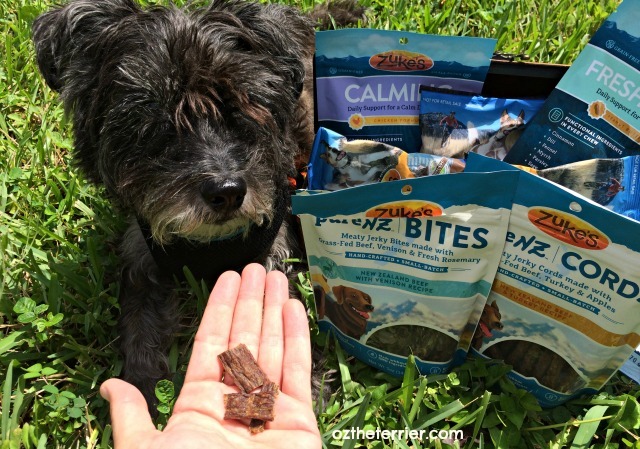 We love Zuke's...and may have to try the calming treats for Jakey, he has a slight separation anxiety issues they may help with! Thanks for the great review! Zukes makes great products and these all sound good. Ding Dong it is William calling Oz ~ Oz the rich in treats with a keister full of Zukes. You're rich Ozzie. Storms don't bother me so I don't need calming but they sure sound great. Like Yumm on my Tummy! Lee will check into these. We love Zuke's products! We haven't tried all of them, but the ones we have, we've just loved. Right now, we're working on a bag of those 2-calorie Yogurt/Maple Syrup Skinny Bakes. I know, we're not small dogs, but they are great for training! New Zuke's stuffs??!!! FABulous!!!! Wows, you gots to try them all??! Lucky doggie you!!!! they look amazin'! Ma will keep a look out! You sure hit the jackpot with great treats there! We still enjoy our Zukes now and then. wow wee look at all those new products.